Our kitchen is truly the heart of our home. We spend a ton of time in here cooking, eating, playing, petting the dog, and everything in between. And it often looks like it. Usually there's a stack of dishes drying next to the sink, apple slices on the counter, and a half-finished art project or two by the window. Last week our countertop was full of baking supplies as I whipped up a loaf of cinnamon swirl bread. This cinnamon swirl bread to be precise. And yes, it was delicious! Later that night, Wilder and I hung out in the kitchen and enjoyed hot-from-the-oven cinnamon swirl bread. It was glorious. One quick look at our kitchen counter after all was cleaned up, because who doesn't love a clean countertop (especially because this seems to only happen when company comes over...)? 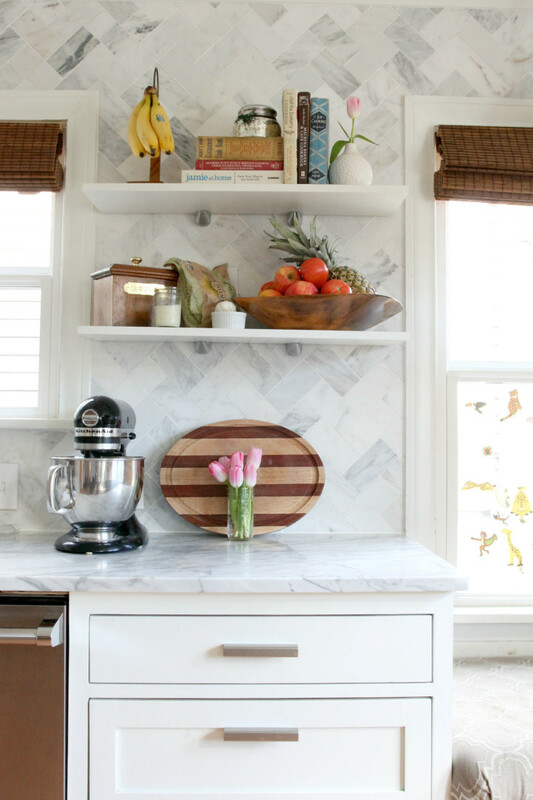 Don't forget to check out these other ladies' kitchen counters! More on our DIY kitchen renovation and resources here. Did you catch our Q&A about the renovation over at Bob Vila? p.s. Do you follow Andy and Candis on Instagram? Do it! Get the back story on their old house renovations before their new show breaks on HGTV! p.p.s. A beautiful new old farmhouse in Connecticut. p.p.p.s. Here is some serious kitchen eye candy to get you through your day. You're welcome.